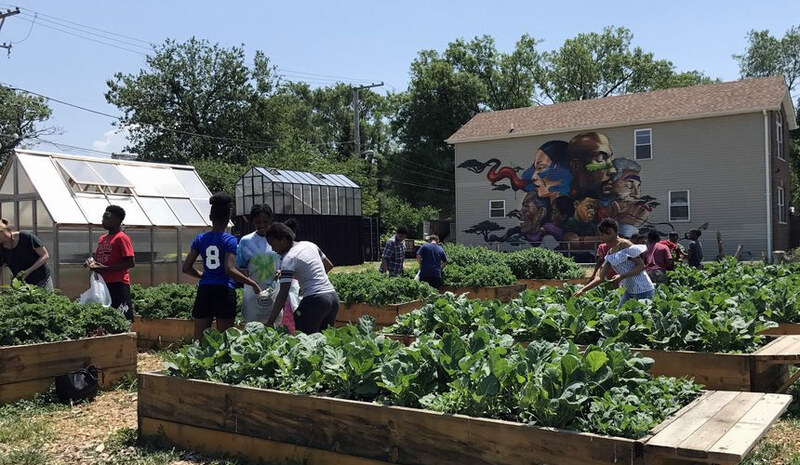 Sweet Water Foundation transformed four blocks in Englewood to cultivate community and help build skills, resources, and opportunities for residents. Where once there were vacant lots and houses that residents avoided for fear of crime and trouble, now there is a verdant urban farm and community garden, a barn that hosts DJs and neighborhood events, a rehabbed foreclosed home now known as the “Think-Do House,” a shipping container transformed into a greenhouse with solar power, a carpentry workshop, and a pocket park. This is the work of the Sweet Water Foundation, which Emmanuel Pratt co-founded and runs with a handful of collaborators on four transformed blocks straddling the Englewood and Washington Park neighborhoods. 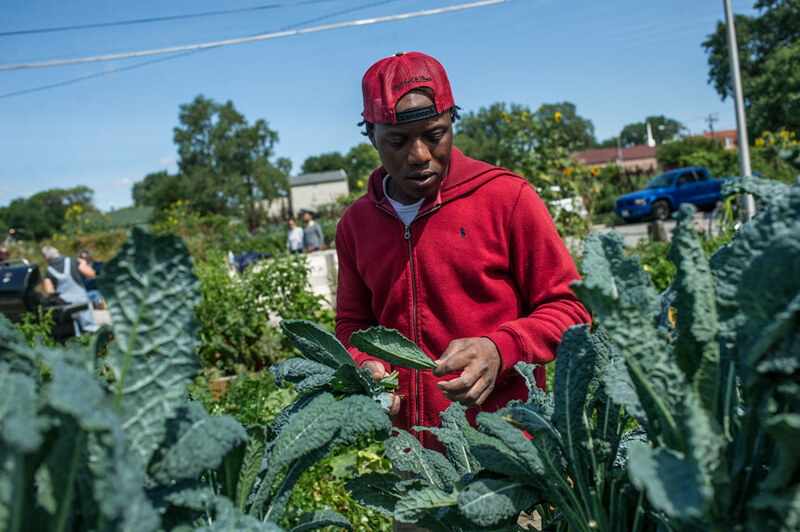 While city planners and politicians have long talked about “urban renewal” for disinvested areas like Englewood, Sweet Water is based on the idea that these communities are rich with human potential and other assets that just need to be cultivated. The land Sweet Water has acquired and transformed on the 5700 block between South Perry Avenue and Lafayette Street is just the beginning. Pratt and his colleagues have high hopes for the surrounding vacant and overgrown land and structures. Today, residents can realize their potential and learn how to build community and create community-driven solutions on that same land. To Pratt it is deeply symbolic that Sweet Water is located on the former site of the Moseley Social Adjustment School – a “school for bad boys” and, in particular, African-American boys, he notes. Today, residents can realize their potential and learn how to build community and create community-driven solutions on that same land. 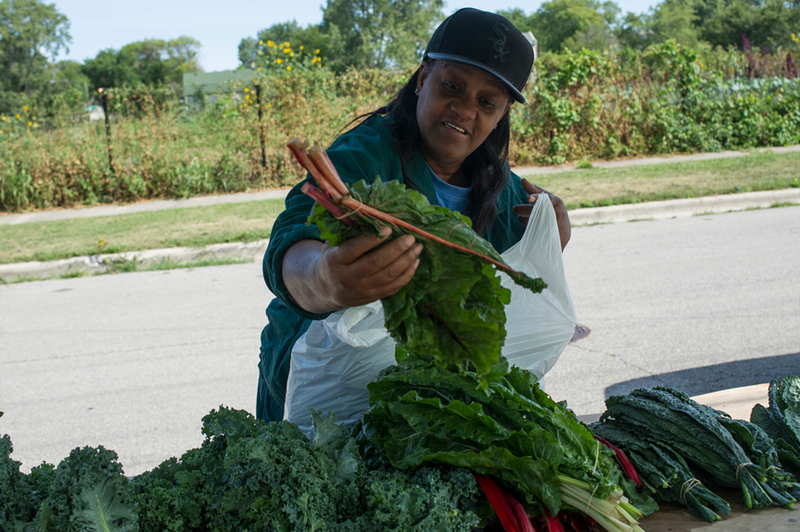 Neighbors are invited to come by and receive fresh produce, acquire new skills, eat healthy food cooked by Mama Betty in the Think-Do House kitchen, or just hang out in a safe and positive environment. Sweet Water is also a magnet for artists, farmers, and entrepreneurs from around the world. Pratt has honed and shared his interdisciplinary approach with colleagues at community organizations and universities across the country, including through his work as a Loeb Fellow at Harvard University. Sweet Water’s Apprenticeship and Outreach Program offers youth ages 16-24 STE(A+)M-based educational programming, hands-on and project-based career training, mentorship, and community outreach. STE(A+)M stands for science technology, engineering, art + architecture + aquaponics, and math. In a partnership with the Chicago Architecture Foundation, youth also participate in a six-week summer program called Re[CREATE]Ed Spaces where they create designs to meet community needs, using hand drafting and digital tools. And in partnership with the Chicago Academy of Sciences / Peggy Notebaert Nature Museum, Sweet Water engages youth in environmental and ecological monitoring and data collection. Among other experiences, they use smart phone apps to identify butterflies, plants, and birds. One of Sweet Water’s current projects – the renovation of a vacant foreclosed home across the street from the urban farm – will provide a live-work space for out-of-town visitors as well as for community members dealing with housing instability. Sweet Water is also a magnet for artists, farmers, and entrepreneurs from around the world. Intentional and strategic design underpins everything at Sweet Water, from the sleek modular shelves made in the carpentry workshop; to the open timber frame structure of the Thought Barn; to the trail winding through the pocket park, marked by concrete pads bearing images of local plants. The carpentry operation provides career training for youth and other locals. Master carpenter Michael Reynolds leads them in making an array of creative, multifunctional furniture pieces from reclaimed materials, which are sold and exhibited at institutions including the School of the Art Institute, the Smart Museum of Art at the University of Chicago, and Columbia College Chicago. Richard Reeves, 20, has worked at Sweet Water for two years. Sweet Water has inspired him to envision what he wants to see in this area where he grew up. As Pratt walked through the farm he encountered Jay Rockwell, a musician who had heard about Sweet Water and came by to check it out. “I’m in love with this whole entire idea,” enthused Rockwell. In 2017, MacArthur provided a $130,000 institutional support grant to the Sweet Water Foundation.